On RFC 607: MPM Jazz and Megatron created a stir among fans over the weekend. Also: Bumblebee’s long tail bodes well for the franchise, Brian is gaga over the Big Convoy reissue, we almost got a My Little Pony crossover. This week on RFC: If you were looking for news about figures coming up in Siege wave 2, boy do we have the show for you! On RFC 604: In-hand thoughts on Siege Ultra Magnus and Shockwave! Also: G1 is back in a big way! Hasbro Toyshop is being replaced by a “curated experience.” What does that mean? It’s our 2018 Transformers Year in Review! From the closing of Toys R Us, the ending of Power of the Primes, the beginnings of the War for Cybertron, Botbots, Bumblebee, and more! Don’t let the door hit you on the way out, 2018! 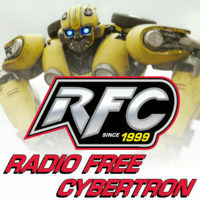 This week on Radio Free Cybertron we discuss the postponement of HasCon, Hasbro’s suit against trademark counterfeiters, upcoming Siege figures and more! We end the show with a somewhat spoilery review of Bumblebee! This week we finally get details on the new direction of the IDW Transformers comics. We also talk about the new Studio Series Optimus Prime from the Bumblebee movie. And there’s also the Reissue G1 Optimus Prime coming to Walmart next year. Then we move on to a bunch of announcements of new Flame Toys models and figures which includes, umm, two more Optimus Primes. I’m starting to think he might be a popular character. All that and Toyworld gives us a bit of Christmas spirit in a package you might not quite expect.